Open Escrow – All your money goes to an objective third party until all terms are agreed upon and finances are cleared. Address Legal Issues – Get the title insurance cleared to prevent any legal claims down the road. You may even consider a real estate attorney, not just for the title, but for all the paperwork yet to come. 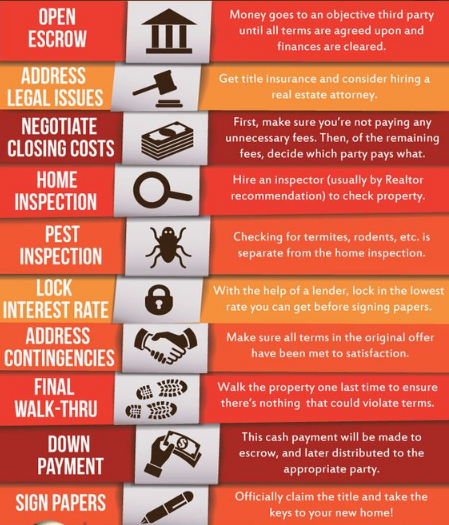 Negotiate Closing Costs – First, make sure you’re not paying any unnecessary fees. A lot of services will sneak in unnecessary fees that a real estate attorney can help you flag. Then, of the remaining fees, decide who pays what. The seller usually ends up paying most of the closing costs. Home Inspection – Hire an inspector (usually by Realtor recommendation) to check out the property. Pest Inspection – This is a separate step from the home inspection. A professional will come out to look for termites, rodents, etc. and any damage caused by such critters. Lock Interest Rate – With the help of a lender, lock in the lowest rate you can get before signing papers. Address Contingencies – Make sure all terms in the original offer have been met to satisfaction. Final Walk Thru – Walk the property one last time to ensure there’s nothing that could violate your terms. Down Payment – This cash payment will be made to escrow, and later distributed to the appropriate party. Sign Papers – Officially claim the title and take the keys to your new home!